Got plans for New Year's Eve? I'm going to try to stop by the Firehouse Gallery in Burlington to see dancer Selene Colburn participate in "freedom of information 2008." It's a day-long endurance/dance piece conceived by dancer and choreographer Miguel Gutierrez, in response to the U.S.-led wars in Iraq and Afghanistan. Gutierrez, who lives in NYC, originally performed the 24-hour foi in 2001, after the invasion of Afghanistan. He's reviving the work in 2008 as a reminder that the country is still at war. And he's invited dancers from all over the country to perform it simultaneously, creating a kind of nationwide day of action. Selene (and 31 other dancers) will be performing Gutierrez's series of movements all day long — while blindfolded or hooded. And wearing earplugs. I’ve always been fascinated by endurance based work, how a body moves beyond a performativity that is about indicating that something is difficult, and actually undergoing a difficult action, so that the body becomes marked by this strain in real time. I think that in the original incarnation of foi 2001, I imagined that the strain of continuously moving for 24 hours was somehow “symbolic” of the difficulty that displaced people must feel. I now feel like this was a terribly naive assumption on my part, and instead, would like to consider that the “difficulty” that is being symbolized in foi 2008 by continuously moving for 24 hours has to do with how hard it is to remain committed to consciousness, to sensitivity and compassion, how hard it is to stay “awake” to the reality of remote war. See Selene dance at the Firehouse Gallery in Burlington on New Year's Eve, December 31. It looks like, from the Facebook event listing, that the public will be welcome from 9 a.m. until midnight. Admission is free. Happy Holidays, Blurt fans! It's been quite a year, what with Karl Lagerfeld moving to Vermont, and Burton putting out those controversial snowboards, and the bitter hipster kickball debate of aught eight. The Seven Days staff typically takes a break over the holidays — we produce two issues in one week in the middle of December, so that we can take off for a couple weeks or so at the end of the month. We put the last issues of the year to bed last Tuesday, and now everybody's off until Friday, January 2. We'll be posting infrequently to Blurt until then. Next week's issue of Seven Days will be up on the web as usual on December 24, but the print edition won't hit the stands until Friday. We hope you enjoy it! Thanks for reading. In an attempt to give students a taste of what it's really like in a newsroom, journalism professors at St. Michael's College in Colchester are trying a new, unprecedented teaching technique — they're laying off their students. This year the kids are getting pink slips instead of report cards. The profs are making a change, though, according to What's Good blogger Tyler Machado, a junior at St. Mike's who's studying journalism. The move is largely designed to provide journalism majors with the wide range of media experience they need to graduate into today's journalism world. No longer is it good enough for a reporter to know how to take good notes and write a print story on deadline. The trend now is for "backpack reporters" — journalists who can write, record audio, take pictures and video, and craft a full media package for a story for a print setting and for the Web. Seven Days — giving you the full media package since 1995. New slogan? What do you think? Ok, so we didn't actually have a website until 2000, but still. Writing in the Washington Post's political blog The Fix, Chris Cillizza today examines the political future of former Vermont Gov. Howard Dean, the outgoing chairman of the Democratic National Committee. With the economy in a tailspin, and few posts remaining in President-elect Barack Obama's administration, it seems clear that Dean may have to look outside of Washington, DC for his next gig. "Those closest to Dean insist that he has any number of job offers to weigh (although they wouldn't expound on any specifics), is traveling to Europe three times early in 2009 to advise progressive parties abroad about the lessons learned from the 2008 campaign and is speaking out on his pet issue — health care — as he did on Wednesday at a speech to the National Institutes of Health." Cillizia adds that the man who "ushered in an era of person to person politics linked by technology, finds himself as a man without a home speaks to the vast chasm between how he is perceived by the netroots and the party regulars." Washington and party insiders, like Obama's chief of staff Rahm Emanuel, never liked Dean or his 50-state strategy. In a recent interview with comedian DL Hughley on CNN's DL Hughley Breaks the News, Dean said he didn't feel vindicated by the fact that his 50-state strategy is being credited with the Democratic takeover of the White House and Congress. DL: You had a lot of detractors... many people thought that it [50-state strategy] wouldn’t be successful, including Rahm Emanuel... How do you feel? Do you feel vindicated? DEAN: No... Rahm ended up as chief of staff to Barack Obama so I don’t feel too vindicated. DEAN: Ah, DL I might have been right but I’d rather be chief of staff. Rather than secret talks with Illinois Gov. Rod Blogojevich, you can imagine Emanuel saying this about Dean as a cabinet pick: "Look, I don't give a (bleep) about his 50-state strategy. These posts are (bleep) gold. I'm not going to appoint that (bleep) to (bleep) position in this (bleep) adminstration. Let him go scream his (bleep) head off." Dean was seen as a leading candidate for Health and Human Services Secretary, but that post went to former Sen. Tom Daschle. More recently, Dean was reported to be lobbying for the post of Labor Secretary. However, it appears as if that job will be handed over to Michigan Gov. Jennifer Granholm. Given his recent talk at the NIH, one has to wonder if health care will be to Dean what global warming was to former Vice Pres. Al Gore. Cillizza does believe Dean will reemerge in politics in the future, but not in Vermont. Who knows? It's a long time between now and 2010 and at the rate that Obama is plucking members out of the Senate take on roles in his new administration perhaps Sen. Patrick Leahy will end up with a plum post. Attorney general if Eric Holder's nomination falls flat? Supreme Court justice? Ambassador to Canada? OK, maybe not. There are those pesky rumors Leahy may not run for reelection in 2010, but I find that hard to believe given the Democratic gains and his top ranking in the Senate. He's now the fourth most senior member of the Senate. In any event, if you hear of any good jobs out there for Howard Dean — feel free to pass them along. 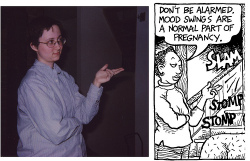 Cartoonist Alison Bechdel has a new book out, The Essential Dykes to Watch Out For, an anthology of her now-defunct "Dykes To Watch Out For" comic strip. I wrote about the book this week for our Winter Reading issue. My essay ("The Essence of 'Dykes'") revolves around the fact that I worked as Alison's assistant from 1998 to 2000, and then again from 2003 to 2005. One of my jobs was to pose as characters from the comic strip so she could draw them more accurately. So when Alison blogged about the essay today, she included this photo. It shows me posing as Ginger in 1999, for episode #308. I know, I know, I look like a 12-year-old boy. I think I was 23, maybe 24. I should add that my partner, Ann-Elise, takes issue with one point I made in the story. I wrote that I saved Sparrow's baby, Jiao Raizel. But Ann-Elise points out that, in fact, I was not the only one — she, too, argued passionately against Sparrow having an abortion. Just wanted to acknowledge publicly that that is, in fact, true. So J.R. fans can thank her, too. Videographer Eva Sollberger also got to work with Alison this week — Eva profiled the "Dykes" cartoonist for this week's episode of "Stuck in Vermont." Last night, the Burlington City Council conditionally approved Champlain College's plan to purchase the Ethan Allen Club on College Street. That's the word from Joe Reinert, assistant to Burlington Mayor Bob Kiss. Stay tuned to Blurt for more details. Click here for background on the story. One of the most clicked on websites in Vermont this morning was probably a special page set up by the Department of Finance & Management that lists $19.7 million in proposed budget cuts. The cuts were agreed to by the Douglas administration and the Joint Fiscal Committee over the weekend, though talks have stalled on the remainder. In all, the Douglas administration wants the special legislative committee to approve $37 million in cuts. Committee members, however, say they do not have the authority to make some of those cuts because they affect state policy. 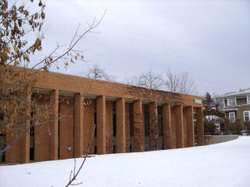 The committee believes cuts affecting policy should be discussed by the full legislature when it convenes Jan. 7, 2009. The list was supposed to be made public at 10 AM, but web traffic was so intense that it caused some "technical difficulties". State staffers are working on the problem. I wonder if programming support has been offshored? When they get the documents up there, what we'll see is the approved list of cuts. Overview of Rescission & Public Hearing: Tuesday, Dec. 16th, 2-5 PM (Room 11, Statehouse). Public Hearing: Wednesday, Dec. 17th, 1-4 PM (Room 11, Statehouse). Committee Discussion & Vote: Friday, Dec. 19th, 9-11 AM (Room 11, Statehouse). The Douglas administration has balked at making its entire $37 million list of proposed cuts public. "The format for discussions was agreed to by both sides, and because of the short timeframe, all sides believed the work with the JFC was the best way to proceed," said the gov's spokesman Steve Wark about why they are not making the full list public. One of the cuts Wark did mention is a 5 percent across-the-board salary cut for all "exempt" employees (i.e. political appointments) making $60,000 or more. A nice gesture, but don't forget—a number of top Douglas aides for Douglas got 10-25 percent salary boost over their counterparts in Gov. Howard Dean's administration six years ago when they took office. And, they've been getting raises and bonuses ever since.